Stand out and shine in a metallic sandal from Rachel by Rachel Roy. The Pesara Flat Sandal will take your style above and beyond this season. Subtle can be oh-so-chic. 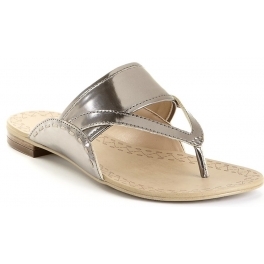 The simplicity of Rachel Rachel Roy's Pesara sandals is what makes them so charming. With a classic slip-on style and versatile shimmer, you can easily add them to any look.